> Hank's Surplus Heavy Duty D-Ring Cobra Gun EDC Riggers Belt 1.5"
Hank's Surplus Heavy Duty D-Ring Cobra Gun EDC Riggers Belt 1.5"
Hank's Surplus Heavy Duty D-Ring Cobra Duty 1.5" EDC Riggers Gun Belt. 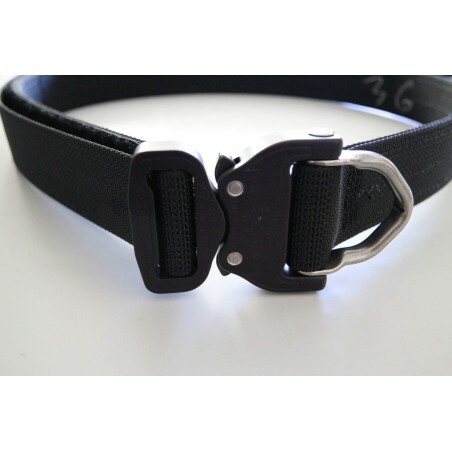 This rugged every day carry belt is a must have for any outdoor enthusiast, hunter and shooter. Carry your holster, knife and accessories with ease. Made in the USA by Hank's Surplus. All materials such as the webbing, thread and Velcro are made in the USA. The AustriAlpin buckle is not made in the US. Belt is Berry compliant. Black belt color consist of 1.5" heavy duty nylon dive belt webbing. It is very stiff. Comes with bonded nylon thread. Dual layer webbing. This creates a very rigid stiff belt to secure your load bearing items. AustriAlpin D-Ring Cobra buckle. Color black. Velcro closure at strap ending. Please allow 2-3 business days for manufacturing time. Note: This belt has not been tested for climbing or repelling. There is about 4" of adjustable belt length. Belt is not adjustable downward. In general we recommend ordering the same size as your pants size. For example if you are a 36" pants size then order a 36" belt. Please note many major clothing brands misrepresent actual waist size with pants size. They do this to make customers feel slimmer. We have taken this sizing discrepancy into account so don't order what your actual waist measures, but order your pants size normally worn.